1. A bucket bag that proves you *can* take things you love with you. At least to the store. Get it from Amazon for $28.99 (also available in white). 2. A succulent necklace available in both day and night colors that'll keep you appropriately accessorized no matter the time. 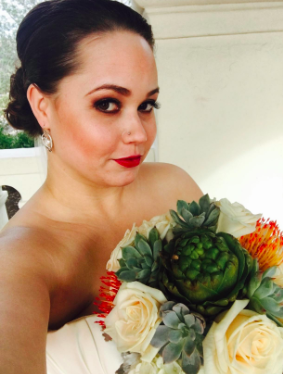 Promising review: "This is now my favorite necklace that I own. I'm borderline obsessed with plants, and being able to wear a wonderfully illustrated terrarium in enamel form is perfect." —Alisha W.
3. A refreshing sheet mask to match all your fav houseplants. I used this a few nights ago and it's refreshing AF. Get it from Ulta for $3.75. 4. A pretty planter that'll cradle your newest plant babe. Get it from Urban Outfitters for $14. 5. A garden journal for keeping track of what you've planted and when to water them! Get it from The Far Woods on Etsy for $20. 6. 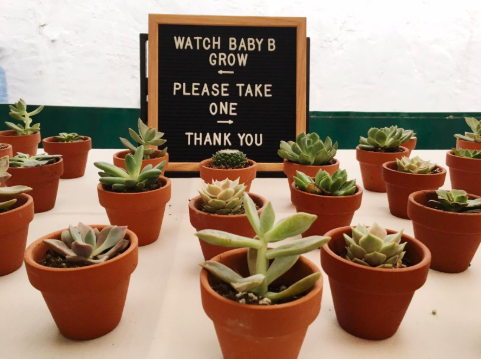 A horde of live succulents ready to nestle in wedding bouquets, pot as baby shower favors, and just generally share the succy love. Get 12 from Amazon for $29.99. Looking for something different? Here are the best places to buy houseplants online. Get a set of 8 from Amazon for $23.99. 8. A trio of planters with bamboo bases to achieve all your minimalist old plant lady dreams. Get them from Amazon for $15.97. 9. A highly-rated misting sprayer that'll look pretty, too. Promising review: "The plant mister is just pretty! I couldn't wait to use it after I got it. Now it is beside my little flower pots, as part of the decoration. Besides pretty, it works great, too! It is easy to spray water, very uniform. Every year I bought a plastic plant mister and had to through it away several months later. This one is the most expensive one, buy every penny is deserved." —J.Q. 10. A gorgeous bralette with an embroidered garden you'll wanna show off in the wild. Get it from Birds & Beestings on Etsy for $120 (available in sizes S–M). 11. A glass pentagon terrarium to fill up with plants. Get it from Amazon for $21.66. 12. A set of three cactus and succulent pins so you can wear your plant love on your denim jacket sleeve. Promising review: "BEAUTIFUL! I love that it was rose gold colored, as well. Thanks!" —Rafella G.
Get it from JackiitheCreative on Etsy for $15.10. 13. A pair of wall planters with enough space for a succulent or two. Promising review: "Love these. Nice, but really small. 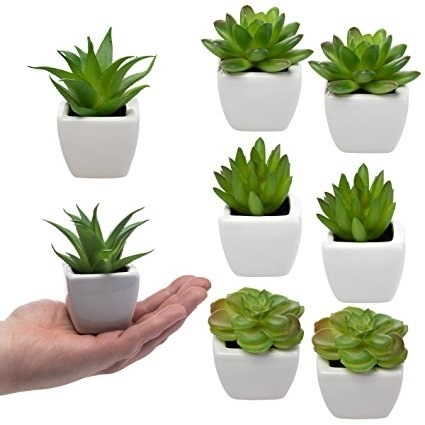 They're good for putting small succulents in them, and maybe some other small things like paper clips or thumb tacks. Also comes with matching gold screws, but I chose not to use them. Very pleased with my purchase." — Jacquelyn H.
14. A happy rug to greet you when you get in the door and it's time to water your plants. Get it from Urban Outfitters for $18. 15. A faux-succulent necklace featuring tiny versions of the polymer clay variety, in case you're concerned about doing the same with live plants! Get it from So Foxy Polymer Clay Design on Etsy for $35. 16. A downloadable print to frame and park beside your real plants. Get it from Paper Storm Prints on Etsy for $5.60. 17. A pack of owls that'll feel the same way about plants as you. 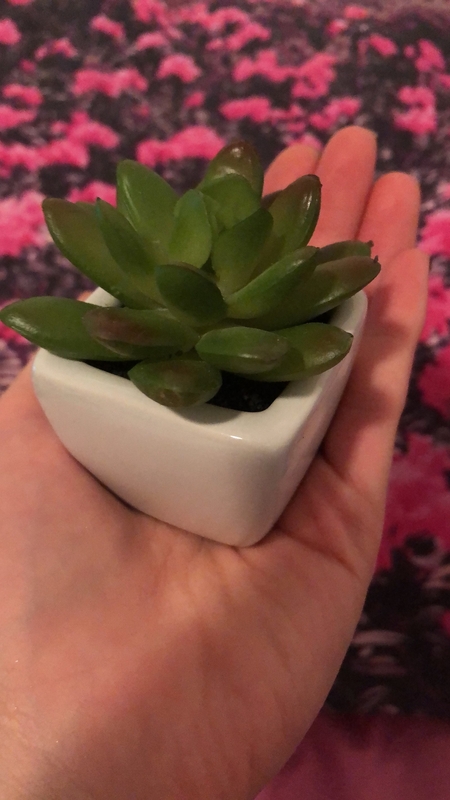 Promising review: "Cutest pots ever! Love them! They are perfect for the small succulents from the store or if I am propagating some smaller plants. I have them throughout the house, including the kitchen window and on our sunny patio. The drainage hole on the bottom is sufficient. Pots came without any being cracked or chipped." —Natasha H.
Get them from Amazon for $14.80. 18. A baby terrarium necklace with a living succulent inside of it you'll adore. Get it from Amazon for $13.78. 19. A matching pet succulent keychain for keeping you feeling green on the go in the best way possible. Get it from Rock N Rose for $16.33. 20. A VW bus-shaped planter as a way to channel extra good growing vibes. Promising review: "This is awesome, great work it’s so nice. Gave it as a gift with potted plants in it." —Trina M.
Get it from Iron Maid Art on Etsy for $45+ (available in two sizes). 21. A set of 10 notecards to express your succulent love with the people you love. Promising review: "Very well-packaged cards, very fast delivery. Excellent friendship cards for my friends who are graduating!" —Mengjin S.
Get them from Champaign Paper on Etsy for $10. 22. A monochrome hanging wall planter in two sizes can accommodate your growing plant collection in the most grammable way. 23. A pair of tiny succulent earrings made from polymer clay but will look *so* real people may just stare at your lobes to solve the mystery. Promising review: "Bought these as a gift for my coworker and love them! Perfect price, nice simple packaging, and arrived on time. Thanks!" —Spencer B. Get it from The Artisan Bundle on Etsy for $10. 24. A colorful laptop skin can help you forget you're working in an office and not outside in nature. Promising review: "Love that the design is on a transparent back, as well. Many just cover the front. Very pretty design and well-made!" —Mary Anne S.
Get it from MarmoriAlbo on Etsy for $44.99+ (available in several sizes). 25. A dainty ring featuring a silver sedum plant for occasions when you can't take your plants with you. Get it from AWildViolet on Etsy for $42 (available in two finishes, sizes 2–12). 26. A sweatshirt that'll proudly display your plant love. Promising review: "I love this so much, have received so many compliments and I wear it everyday!" —Para M.
Get it from Real Rebel on Etsy for $24.99 (available in two colors, sizes S–XL). 27. A book to help take any succulent grower to the next level. Get it from Amazon for $24.95, Barnes & Noble for $24.95, or a local bookseller through IndieBound. 28. A ceramic "Plant Lady" mug in case your green AF desk isn't giving off those vibes already. Promising review: "Adorable mug. Feels great in the hand and the color looks beautiful in person. The packaging it came in was also beautifully done. I opened the box and smiled. Highly recommend!" —Kate K.
Get it from Rosalynnelove on Etsy for $16.50. 29. A pair of plucky socks with a bright pattern that won't disappoint for some green toes, too. Get them from Amazon for $9.95. 30. A curvy wave planter that might as well have come straight out of the sea. Promising review: "I LOVE this little planter. My succulents look adorable in it, and I also really appreciate the draining hole and the saucer that comes with it. Very happy!" —Danielle W.